Early on, Caravan were a part of London’s underground psychedelic scene, gigging with Yes, Pink Floyd and Soft Machine in the late 60s. Soon they became one of the central artists on the so called Canterbury scene, caracterized by an improvisational avant-garde and soft jazz approach where the musically silly and the musically complex goes hand in hand. Many consider ”In the Land of Grey and Pink” (1971) to be one of progressive rock’s seminal albums, carefully remixed in stereo and 5.1 by Steven Wilson of Porcupine Tree for a tasteful Deluxe edition on it’s 40:eth anniversary. The lengthy fuzz Hammond solos on the sidelong ”Nine feet underground” or on the previous album’s ”For Richard” are pure prog delight. Those familiar with other Canterbury acts like Soft Machine, Camel, Hatfield and the North or Gong probably know their Caravan already. Still, they can be described as a quite melodic and accessible alternative, with plenty of both poppy tunes and mindblowing solo excursions. 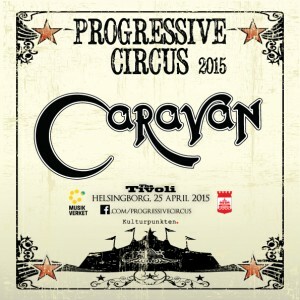 To celebrate their 48th year, Caravan will do their FIRST SWEDISH GIG EVER when headlining Progressive Circus 2015. Founder Pye Hastings (guitar, vocals) and 70s members Geoffrey Richardson (guitar, viola, violin) and Jan Schelhaas (keyboards) will serve you some iconic prog pieces, together with Jim Leverton (bass) and Mark Walker (drums, percussion) on the main stage of The Tivoli on April 25th. DO NOT MISS THIS PROG HISTORIC EVENT!! !